A long-missing piece of horror film history, thought lost for decades, has finally resurfaced. Best of all, it can now be part of your DVD collection. The Frankenstein story has been told many times on film, most notably in the string of pictures released by Universal in the 1930s and 1940s starring Boris Karloff, Lon Chaney Jr. and Bela Lugosi, as well as the Hammer films of the 1950s through the 1970s featuring Peter Cushing as the doctor who brings life to a creature assembled out of parts. 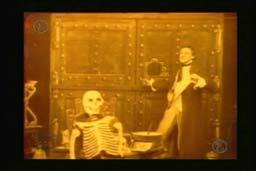 But few know that the first rendition of Mary Shelley's story was released nearly one hundred years ago, in 1910, shot by the Thomas Edison studios. Long believed to be a lost film, this treasure has finally resurfaced on DVD. The Edison Frankenstein has for many years been on the American Film Institute's list of most wanted lost films, even though it had been known for decades that this single surviving print had surfaced in the possession of Alois Dettlaff, a long-time Wisconsin film collector. The film was given a gala public showing on April 24, 2003, as a fundraiser for the Fort Lee Film Commission, and Mr. Dettlaff there released the first copies of a DVD version of this ultra-rarity. Although only 975 feet long, and running a brief 12m:38s, this pivotal film stars Charles Ogle (who would have a quite successful career during the silent era) as the monster. Ogle reportedly did his own makeup for the part, and it's quite a nasty vision. The influence of Ogle's makeup can be seen in the Universal pictures, most notably in the extended brow and flat head. Ogle's monster also features long talons, a detail that would be echoed in Max Schrek's rendition of Count Orlok in Nosferatu. Ogle seems to be having a great time here, as he madly chews the scenery as the monster, vindictive against his creator. The supporting roles of Dr. Frankenstein (Augustus Phillips) and his fiancée Elizabeth (Mary Fuller) are essentially stiff and unconvincing. J. Searle Dawley directed, and even though bound to the convention of the tableau-style shot—where the camera remains fixed at a medium distance—the staging still manages to carry an impact. Particularly noteworthy is the creation scene, using puppetry and running the film in reverse to create an illusion of the figure of the monster taking shape. Cleverly, the director doesn't give us a good look at the creature until a bit later, when it bursts through some curtains (talons first) in Frankenstein's bedroom. The result must have been truly horrifying to 1910 viewers. This same effect was echoed by James Whale in the 1931 Frankenstein, when Karloff's appearance is held back until just the right shocking moment. Although a videotape version of the film was released in conjunction with a book some years ago, that was reportedly both an iffy reproduction and suffered from the scrolling legend, "Property of Alois Dettlaff." Obviously, that is not acceptable for a discriminating film fan, and the new DVD is a big improvement over that primitive form of copy protection. Taking a page from the methods of American Biograph and Edison himself, there is a small "ADA" (Alois Dettlaff Archives) logo in the lower left throughout the film. However, it is usually not distracting since it's covered by the tinting. There are also script "E" logos, which Edison often used, marked in the upper left and lower right of the picture; the photos of the actual film I've seen don't appear to have these, so I expect that they were added for whatever reason by Mr. Dettlaff himself. Be that as it may, the transfer is quite well done. The beginning of the picture has a bit of nitrate decomposition, indicating that it was probably just saved in the nick of time. The critical sequences featuring the monster are all more or less intact and plainly legible, absent a couple of jumpy splices. The tinting is subtle and appropriate and does not obliterate detail. I didn't notice any compression artifacts either. The musical score is performed on an uncompressed PCM track, featuring music from the original Edison cue sheets for a truly authentic viewing experience. The sound on Frankenstein is quite good and the score works nicely with the picture. The titles and intertitles appear to be freshly minted; there's no indication as to whether the original titles survive. Accompanying Frankenstein, under the banner title of "Movies' First Monsters" is the first (and illegal) adaptation of Dracula, F.W. Murnau's 1922 Nosferatu. The print used here is derived from the Museum of Modern Art print, featuring the character names from Bram Stoker's novel instead of Murnau's. It's in slightly rough but decent shape, suffering a bit from high contrast. 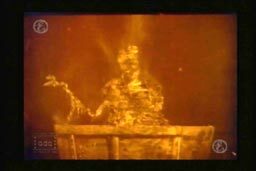 While it doesn't match up to either the Image or Kino DVD releases of this public domain staple, it does feature one important advantage: the film (like Frankenstein) has been generously windowboxed, with the entire frame retained so that it can be viewed without loss of critical information to overscan; this, more than any other film, uses the entire frame and so makes an attractive option for someone who doesn't already own the aforementioned releases. A very thoughtful touch. The disc is available directly through Mr. Dettlaff's company, at $24.50 for the DVD and shipping/handling of $5.50 as of this writing (free shipping if 3 or more are ordered). For lovers of silents or horror films, this limited release is truly a dream come true. In addition, a package of the limited edition book (which we've not seen) and DVD is available at firezine@intrepid.net Contact that email address for details.